The aim of the Budapest Conference was to advance dialogue and reach agreement between key stakeholders on the need to address the problem of large-scale bird mortality on power lines at the European level. 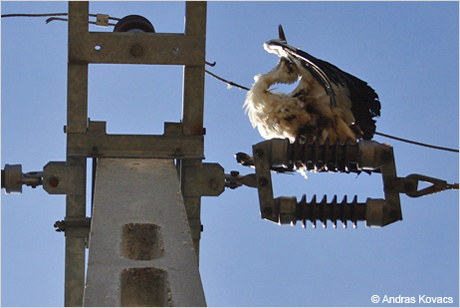 Mortality on power lines, especially due to electrocution, has been confirmed as one of the main threats for bird species such as Spanish and Eastern Imperial Eagles and others listed in the Birds Directive and the global Red List. Electrocutions can also disrupt electricity supplies, causing economic disruption and requiring costly ‘retrofit’ investments to make power lines safe. Fortunately, however, the problem can be almost completely eliminated from the outset through well-proven mitigation measures, bringing benefits for birds, grid operators and electricity consumers alike. Large scale 'bird-safety' measures and specific local actions are priority conservation actions in many EU bird Species Action Plans. Many grid operators and regulators have also realised the benefits of eliminating electrocution risks, often working with bird conservation organisations to ensure win-win solutions are found. The Conference was attended by 123 participants of 29 European and Central Asian countries, the European Commission, UNEP-AEWA, six energy and utility companies, experts, businesses and NGOs.